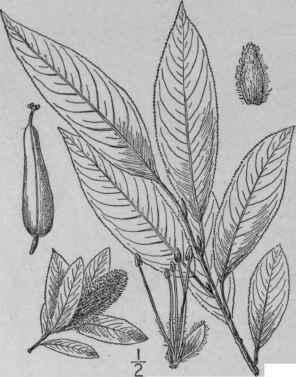 Salix lucida Muhl. Neue Schrift. Ges. Nat. Fr. Berlin, 4: 239. pl. 6. f. 7. 1803. A tall shrub, or sometimes a tree 200 high, the bark smooth or slightly scaly, the twigs yellowish-brown, shining. Leaves lanceolate, or ovate-lanceolate, mostly long-acuminate, narrowed or rounded at the base, sharply glandular-serrulate all around, green and glossy on both sides or bearing a few, scattered hairs when very young, 3-5' long, l'-l 1/2 wide when mature or sometimes persistently pubescent; stipules small, semi-cordate or oblong, very glandular, commonly persistent; petioles stout, 3"-6" long, glandular at the base of the blade; aments hairy-stalked on short, lateral leafy branches, the staminate stout, 1'-2' long, the pistillate 2'-3' long in fruit; bracts deciduous; stamens about 5; filaments pubescent below; stigmas stalked or nearly sessile; capsule narrowly ovoid, acute, glabrous, much longer than its pedicel. In swamps and along streams and lakes, Newfoundland to Athabasca, New Jersey, Kentucky and Nebraska. April-May. 5. lucida serissima Bailey; Arthur, Bull. Geol. Surv. Minn. 3: 19. 1887. 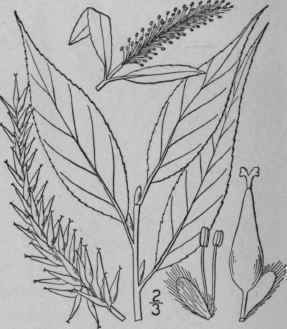 S. serissima Fernald, Rhodora 6: 6. 1903. 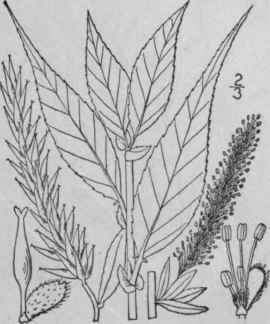 A shrub, up to 12° high, the bark brown or yellowish-brown, shining. Leaves oblong-lanceolate, lanceolate or elliptic-lanceolate, mostly acute or short-acuminate at the apex, narrowed at the base, glabrous, glandular-serrulate, dark green and shining above, pale beneath, 1 1/2'-4' long, firm in texture; petioles slender, 6" long or less, with 2 to 6 glands at the base of the blade; aments terminating leafy branches, the stalk and rachis pilose; staminate aments about 1/2' long, the pistillate 1'-2' long in fruit, persistent until autumn; scales deciduous; filaments hairy below; stigmas distinctly stalked; capsule conic-subulate, glabrous, 3"-6" long, short-pedicelled. In bogs and swamps, Quebec to New Jersey, Alberta and Wisconsin. May-July. Salix fragilis L. Sp. PI. 1017. 1753. A tall, slender tree, with roughish gray bark, attaining a maximum height of about 8o° and a trunk diameter of 7o, twigs reddish green, very brittle at the base. Leaves lanceolate, long-acuminate, narrowed at the base, sharply serrulate, glabrous on both sides, rather dark green above, paler beneath, 3'-6' long, 1/2'-1' wide; glandular at the base of the blade; petioles 3"-8" long, glandular above; stipules semicordate, fugacious; staminate aments 1'-2' long; stamens 2, or sometimes 3-4; filaments pubescent below, distinct; pistillate aments 3'-5' long in fruit, rather loose; stigmas nearly sessile; capsule long-conic, glabrous, 2 1/2-3" long, short-pedicelled. Escaped from cultivation, Newfoundland to New Jersey and Kentucky. Native of Europe. 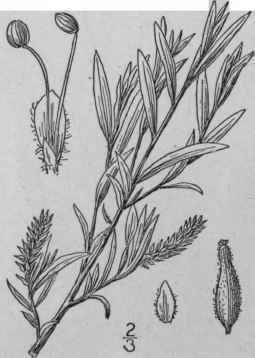 Hybridizes with Salix alba. The twigs break away and grow into new plants. Stag's-head, red-wood or varnished willow. April-May. Salix pentandra L., the bay-leaved willow of Europe with shining ovate-oblong, short-acuminate leaves, and smooth long-conic capsules rounded or impressed at the base, is much planted for ornament, and occasionally escapes from cultivation.